Aim: To compare the single-layer endometrial thickness (obtained with sonohysterography [SHG]) with double-layer endometrial thickness (obtained with transvaginal sonography) in women without endometrial malignancy. Methods: We retrospectively studied consecutive patients from July 1, 2006, through June 30, 2007, who underwent SHG. The double-layer endometrial thickness was measured on longitudinal images of the uterus in the thickest portion of the fundus before saline infusion. The single-layer endometrial thickness was measured during SHG in the longitudinal-axis view in the thickest fundal portion anteriorly and posteriorly. Results: During the study period, 303 women underwent SHG. Pathology results were available for 128 women. In the 124 women with normal benign endometrium, the mean anterior endometrial thickness was 0.37 cm and the mean posterior endometrial thickness was 0.39 cm. The thickness of the mean anterior endometrium was not significantly different from the mean posterior thickness (P=.12). The difference between the mean double-layer endometrial thickness and the mean sum of single-layer thickness measures (i.e, sum of anterior and posterior layers) was 0.06 cm, even when intracavitary masses were excluded (P<.01). Conclusions: In women with histologically normal endometrium, the anterior and posterior endometrial layers appear symmetric in thickness. Further study characterizing endometrial thickness during SHG in women with endometrial neoplasia is needed. Sonohysterography (SHG) is frequently used to evaluate the endometrium for various indications such as infertility and abnormal uterine bleeding. Many studies define the expected endometrial thickness, specifically the double-layer thickness, by transvaginal sonography. A recent consensus statement from the International Endometrial Tumor Analysis group endorsed the concept that the endometrial layers should be measured individually in the presence of intracavitary fluid if asymmetry is present . However, there is no definition for asymmetry between the anterior and posterior endometrial layers. Similarly, normal values for single-layer endometrial thickness measured by SHG are not available in the literature. It is unclear whether the endometrial thickness values derived from unenhanced transvaginalsonography apply to those obtained during SHG. Establishing normal values for single-layer thickness may aid in identification of endometrial hyperplasia and carcinoma by SHG. Defining asymmetry between anterior and posterior layers may also have clinical significance with regard to endometrial pathology. The objective of this study was to define the single-layer endometrial thickness obtained with SHG and compare it with double-layer endometrial thickness in women without endometrial malignancy. All patients who underwent SHG from July 1, 2006, through June 30, 2007, at the University of Texas Medical Branch (Galveston, Texas) were identified via an electronic database of sonography reports. University of Texas Medical Branch Institutional Review Board approval was obtained for a retrospective chart review of women who underwent SHG during the study period. Chart review included the ultrasound reports, surgical pathology reports, and operative reports. Surgical pathology reports within 6 months of the date of the sonohysterogram were included. All ultrasound examinations were performed in a dedicated obstetrics and gynecology sonography unit accredited by the American Institute of Ultrasound in Medicine. Patients were referred for evaluation of postmenopausal bleeding or abnormal uterine bleeding. SHG was performed in all patients with bleeding as the indication for the examination. All sonographic examinations were performed and read by one author (D.M.B.) with 10 years of experience in gynecologic sonography. Baseline transvaginal images of the uterus and adnexa were obtained before SHG using a iU22 ultrasound system (Philips Medical Systems) or an HDI 5000 ultrasound system (Philips/ATL Ultrasound). The double-layer endometrial thickness was measured on longitudinal images of the uterus in the thickest portion of the fundus. Either a 5F nonballoon catheter or an 8F balloon-tipped catheter was used to infuse saline during real-time visualization of the uterus by transvaginal imaging. Still images in the longitudinal and transverse planes were obtained. The single-layer endometrial thickness was measured in the longitudinal-axis view in the thickest fundal portion anteriorly and posteriorly (Figure 1). All measurements were taken by the performing sonographer or sonologist during the examination. Figure 1. 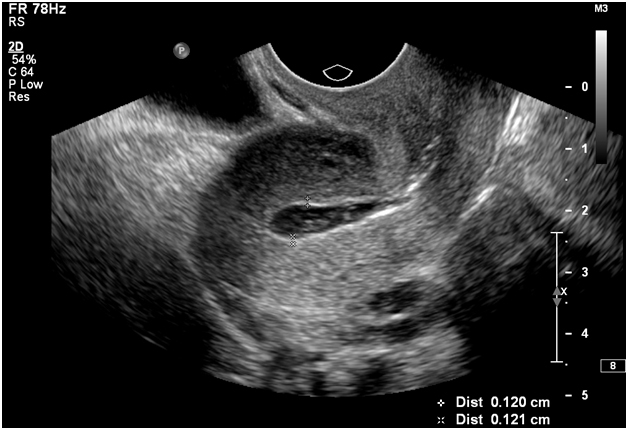 Measurement of endometrial thickness during sonohysterography. Transvaginal image shows a normal uterus and endometrium in the sagittal plane. Data were entered and analyzed in an electronic spreadsheet (Excel; Microsoft Corporation). The 2-tailed paired ttest was used to compare means of normally distributed data. P values less than .05 were considered statistically significant. During the study period, 303 women underwent SHG; 70 women were excluded from analysis (Figure 2). Reasons for exclusion from analysis included missing data on the following parameters: measurement of endometrial thickness in the single layer, double layer or both, and pathologic sampling within six months of the index ultrasound examination. Of the remaining 233 women in the current analysis, the mean age was 42 years (range, 20-76 years). The majority of patients (82%) were premenopausal. SHG findings are described in Table 1. The pre-SHG double-layer endometrial thickness was greater in the polyp group than those with normal SHG findings, but this difference was not statistically significant (P=.22). Pathology results obtained from endometrial biopsy, uterine curettage, hysteroscopic resection, or hysterectomy were available for 128 study patients (Table 2). Figure 2. Participant flow diagram. AUB denotes abnormal uterine bleeding; DL, double-layer; EMT, endometrial thickness; SHG, sonohysterography; SL, single-layer. Table 1. Sonohysterography findings (N=233). Abbreviations: EMT, endometrial thickness; SL, single-layer. aP=.22 comparing EMT for polyp and normal cavity. In the 124 women with pathologically normal benign endometrium, the mean anterior endometrial thickness was 0.37 cm and the mean posterior endometrial thickness was 0.39 cm. The mean anterior thickness was not significantly different from the mean posterior thickness (P=.12). To define asymmetric thickening of the endometrium, we examined the difference between the anterior and posterior measurements. The mean (SD) difference in thickness between anterior and posterior layers was 0.10 (0.11) cm (range, 0-0.86 cm). The distribution of differences in endometrial thickness is shown in Table 3. Table 2. Pathologic findings (N=128). Table 3. Difference between anterior and posterior endometrial thickness measurements in patients with normal endometrium (n=124). Three subjects had pathologically proven endometrial neoplasia. Simple hyperplasia was found in one premenopausal patient with a normal SHG. The difference in endometrial measurements between anterior and posterior layers was 0.21 cm (0.34 cm anteriorly and 0.55 posteriorly). The second patient was postmenopausal and had complex atypical endometrial hyperplasia, with SHG findings of a polyp. On SHG, the anterior and posterior endometrial measurements differed by 0.02 cm (0.17 cm anteriorly and 0.15 cm posteriorly). The third patient was postmenopausal and had an endometrial polyp and International Federation of Gynecology and Obstetrics (FIGO) grade 1 endometrial adenocarcinoma on biopsy. On SHG, an endometrial polyp was seen, and the difference between the anterior and posterior endometrial measurement was 0.12 cm (0.67 cm anteriorly and 0.55 cm posteriorly). The double-layer endometrial thickness obtained with unenhanced transvaginal sonography was compared with the sum of the anterior and posterior endometrial measurements obtained with SHG (Table 4). Results did not differ when subjects were sub classified by menopausal status and re-analyzed (data not shown). Uterine cavity masses may increase the double-layer endometrial measurement obtained with unenhanced transvaginal sonography; thus, we repeated the comparison after excluding measurements from women with intracavitary masses. The sum of single-layer endometrial thicknesses was significantly different from the double-layer thickness (P<.01), even when intracavitary masses were excluded. However, the absolute difference between the measurements was only 0.06 cm. Table 4. Comparison of double-layer endometrial thickness measurement with the sum of single-layer measurements. aDouble-layer measurements were obtained with unenhanced transvaginal sonography. Single-layer measurements were obtained with sonohysterography. was no more than 4 mm in 99.2% of patients. Additionally, the anterior and posterior endometrial measurements were not significantly different, and the differences noted between the sum of the single-layer thicknesses obtained at SHG and the double-layer thickness obtained during transvaginal sonography were not clinically significant. Sonographic equipment generally reports axial measurements to 0.01 mm; however, differences in endometrial thickness of less than 1 mm are unlikely to be clinically important. The strengths of this study include the relatively large sample size and histologic correlation of ultrasound findings in greater than 50% of patients. Additionally, only one physician performed and interpreted all studies. Weaknesses of the current study include a paucity of women who had endometrial carcinoma or hyperplasia, which precluded establishing a diagnostic limit for endometrial thickness with SHG. A larger sample with an adequate number of women with abnormal endometrial histology might help define limits for endometrial thickness with SHG. Surgical pathology results within 6 months of the ultrasound were used in this study. It is possible that patients may have started on hormonal therapy within this time frame. Given the short time frame however, it is unlikely that hormonal therapy would have changed endometrial thickness significantly or increased the risk of malignancy. Surgical pathology samples varied between office endometrial biopsy, dilation and curettage, and hysterectomy. Office endometrial sampling has high accuracy in the diagnosis of endometrial neoplasia, thus the inclusion of office biopsy as a reference standard is unlikely to have missed significant pathology . Our study included mostly premenopausal women with abnormal uterine bleeding. Subjects served as their own controls in that double layer endometrial measurements were compared to the sum of single layer measurements for that subject. While endometrial thickness is greater in premenopausal women, a mixture of subjects of differing menopausal status did not impact comparison of single to double layer measurements. Our study does not offer guidance on endometrial thickness cut-off values in postmenopausal women as already exists in the literature [3-5]. Study of a population with significant rates of endometrial hyperplasia, performing sonohysterography and concurrent endometrial sampling would help to define the role of single layer measurement for diagnosis of endometrial neoplasia. In women with histologically normal endometrium, the anterior and posterior endometrial layers appear symmetric in thickness. Additional investigation using multiple centers and video recording of exams should be performed to validate these findings. 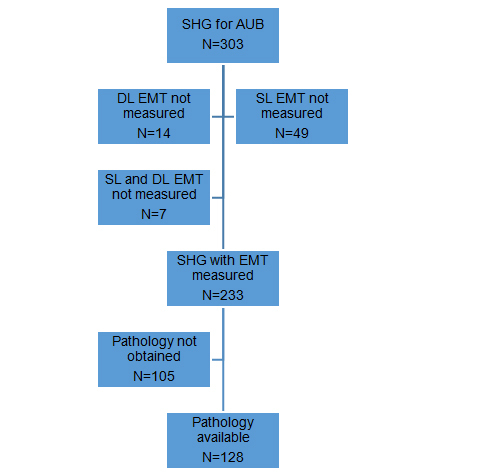 Further work to help define the role of endometrial measurement and morphology during SHG in women with endometrial neoplasia may aid in improving diagnostic accuracy. ©2015 Breitkopf DM. This is an open-access article distributed under the terms of the Creative Commons Attribution License, which permits unrestricted use, distribution, and reproduction in any medium, provided the original author and source are credited. Department of Obstetrics and Gynecology, Mayo Clinic, 200 First St SW, Rochester, Minnesota, USA, Tel: +1 507-266-9137; Fax +1 507-266-7953.